Since 1996, Trex has invented, defined and perfected the composite deck category with a lineup of low-maintenance, high-performance, eco-friendly products that fundamentally change the way we live outdoors. It’s no wonder so many happy deck owners consider Trex the best decking material. 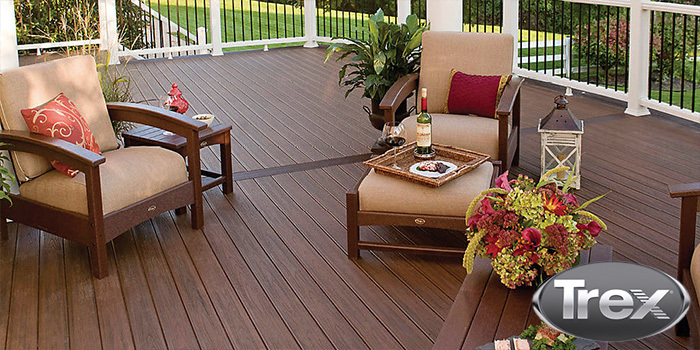 The Trex spectrum of fade-resistant colors features varying tones and wood-grain finishes to give you unmatched control over the design of your deck. Decking and railing featuring unparalleled beauty that is hassle free, fade, stain, scratch and mold resistant, and eco-friendly. High-Performance Technology will beautifully withstand years of sun, sleet and snow. Low-Maintenance Proprietary Shell cleans easily with soap and water. 25-Year Limited Residential and fade and stain warranties. Made of 95% recycled materials. Unlike wood, Trex won’t rot, warp or splinter, fade or stain, need painting, sealing or staining, or become food for termites. Also available is Trex Elevations – a system of durable, triple-coated steel beams, joists and tracks, creating the strongest, straightest and greenest substructure – offering consistency, durability and reliability that wood decks can’t.